In a tight game throughout the Oregon Lumberjacks (3-3) were able to hold onto an early 2-1 lead and ride it to a victory over the Palm Desert Coyotes (1-6). Solid pitching by the Lumberjacks allowed for two runs to be enough. The winning pitcher Kagen Hopkins threw four solid innings on his way to striking out four and allowing just one unearned run. Joseph Perrota and Kevin Rogers combined to throw three scoreless innings to close out the pitcher’s duel. The difference in the game was one swing by Nick Schulz in the second inning. On a 3-2 pitch the San Jose State product redirected a Michael Schroeder pitch 350 feet over the left field wall. 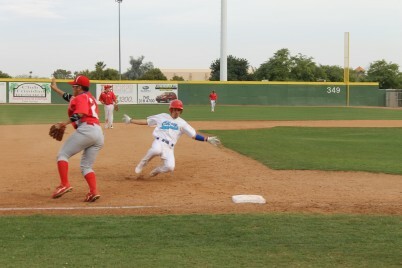 The blast proved too much for the Coyotes to overcome. The Coachella Valley Snowbirds (2-4-1) had no answer for the Bay Area Bootlegger’s (6-0-1) Colby Gurney. Gurney carried a no hitter into the 6th inning, his day ended after five and two thirds of an inning giving up no runs, one hit and striking out five. The Bootleggers did not collect many hits against the Snowbirds, just six, but half of those went for extra bases. The big hit came off the bat of Jonathon Perea in the bottom of the 5th who smoked a double into left center that scored two runs. Casey Cannon was equally as dominant for the Snowbirds on the mound. Cannon tossed two scoreless innings and struck out four. However it was the timely hitting of the Bootleggers that led them to their league best fifth win. Game one at Palm Springs Stadium ended up in a 3-3 tie between the British Columbia Bombers (1-5-1) and the Canada As (4-2-1). The Bombers jumped out to a quick 1-0 lead thanks to an RBI single from Shawn McAndrews in the bottom of the first inning. The Bombers were able to add to that lead in the fourth inning when Chris Valencia drove home Tim Leary with a sacrifice to make it a 2-0 game. Canada fought back scoring two runs to tie things up at two in the top of the sixth inning thanks to an RBI double from Jon Mestas and an RBI groundout off the bat of Jonathan Grishman. After the Bombers took the lead back the As put together a late inning rally knotting things up in the seventh on a Jon Mierles sac fly. It was a battle of Palm Springs teams as historic Palm Springs Stadium played the perfect host for the matchup between the Palm Springs Power and the Palm Springs Chill. A rare cloudy day provided the Coachella Valley with some light breezes and the two offenses took advantage. After the Power had jumped on Chill starter Tae Kyung Lee for 3 runs in the top of the first, the Chill responded in a big way in the very next half inning. Mike Orefice and Kenta Nishii lead off the inning by reaching base. That brought Devin DeYoung to the plate who blasted Heath Gray’s pitch over the left field wall for a game tying three run home run. The game opened up when the Chill sent 10 batters to the plate in a 7 run fifth inning. That would prove to be enough as the Chill defeated the Power 12-7.